The season is changing, whether I am ready for it or not. I have been trying to deny it for the past week, but I am finally trying to embrace it. It dropped down into the 40s a few nights this week, and I needed a sweater in the mornings. Fall is one of my favorite seasons, but it always seems like I’m not quite ready for it to come. I’m not finished growing tomatoes, enjoying the early evening sun or picnicking outside. One of my favorite things about fall is a renewed enthusiasm for knitting. I knit all year long, but I feel a special calling as the weather turns cooler. As the summer draws to a close and the fall starts to edge in, I have decided to knit something that seems to fit the season. 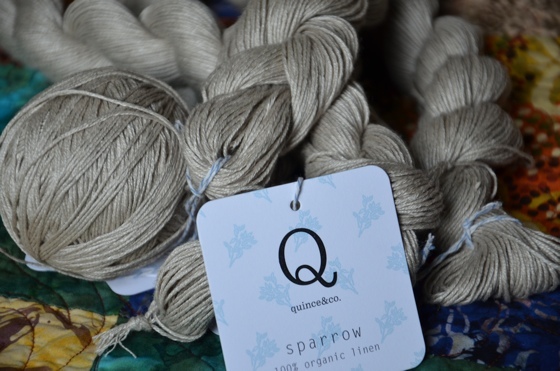 I ordered this beautiful organic linen yarn called sparrow from Quince and Co in order to knit Hélène. This yarn has gotten some mixed reviews, and I am looking forward to trying it out for myself. 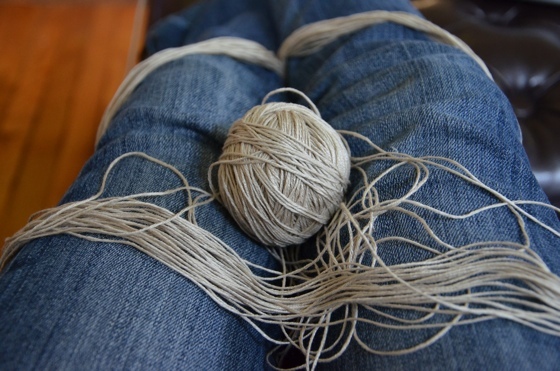 It is supposed to get really soft when washed, but I think some people had issues with the yarn splitting. I will say that it looks beautiful. I love the natural color of the linen. I can’t wait to make this sweater. It is so delicate and feminine looking. I think it was the lighting in this picture that really captured me and made me decide to make this sweater. It makes me want to enjoy every last bit of the summer sun. We’re going on vacation later this week so I am anticipating quite a bit of knitting time! This entry was posted in Crafting by Ashley. Bookmark the permalink.